Women returners: Back to your future: What's your USC (Unique Strengths Combination)? Over the years I've asked many women to tell me their top three strengths. This question typically generates a look of embarrassment, a long pause and then a struggle to get beyond one or two, often prefaced by "Well, I suppose I'm quite good at ..". Despite the growing body of research into the importance of knowing and using our strengths, most of us are far more able to give a long list of our weaknesses than to describe where we really excel. And I've noticed that the strengths women most readily talk about are those which differentiate them the least. By far the most common responses I hear are two of the most generic - "I work hard" and "I'm good with people". Why is this so difficult for us? Unarguably the British culture, together with that of many other nationalities, puts down people who 'blow their own trumpets'. And from school reports to work performance reviews, we're encouraged to recognise our 'development needs' rather than to identify and build on our strengths. We also tend to undervalue talents which come naturally and easily to us, assuming that "everyone can do this" because we don't find it hard. Knowing your strengths is one of the fundamental foundations of managing your career. It will help you to decide what direction you want to take, to build your self-belief as you restart your career, to market yourself effectively in CVs, networking meetings and interviews and, just as importantly, to shape your jobs to best suit you ... not to mention making you happier and more productive. 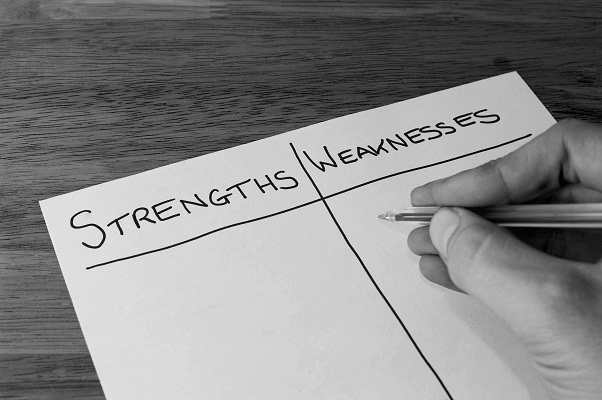 How can you identify your strengths? Think about what you're particularly good at and what energises you. There may be things you do well that leave you drained. These may be your skills, but they're definitely not your strengths. Choose your comparison point as the average person. Don't compare yourself with the best in the business or you'll decide you don't excel at anything! Be specific rather than generic. Think about what differentiates you from the next person. Rather than the bland 'good with people' focus on your particular people skills (directing, coaching, influencing, collaborating, teaching, etc.) and with what types of people you work best. If you're finding this hard, ask your friends/family what they think you're good at & to give you some examples. Other people often notice your talents when you don't and you get the benefit of some positive feedback. Aim to build a long list of strengths, with examples of each (this is a great basis for confidence-building and for interview conversations). Then prioritise, returning to the question "What are your top three strengths?" but this time with a clear, specific and credible response. Loving a good acronym, I've created my own variation on your USP. Think of these three strengths as your USC - Unique Strengths Combination. Recognise how this mix of strengths positively differentiates you from the next person, both during the job search process and when you're back at work. And make sure "I work hard" isn't one of them! See Setting your career compass to read more about the benefits of using your strengths and for more ideas on identifying them.